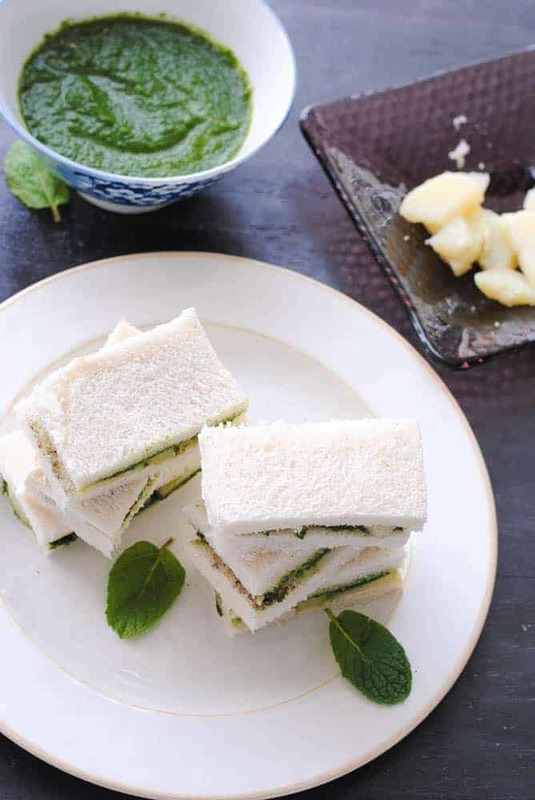 These easy and tasty chutney sandwiches are made with fresh cilantro, mint, butter and potato slices. Yum! Want something quick and tasty to nibble on? Make some chutney sandwiches! There are so many ways you can have them … as a mid-morning snack at work, with a hot cup of tea in front of the television (my favourite) or just when the mood grabs you, wherever and whenever. Honestly, they’re so easily assembled that I don’t have to think twice about making them. I’ve even put some in my kids’ lunch bags occasionally and they haven’t complained. They’ve actually rather liked them! And the good thing is that when you’ve made one batch of chutney, it lasts a few days in the fridge. So you don’t have to make it fresh every time you want to have these beauties. 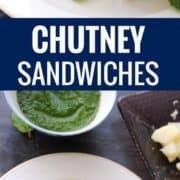 The cilantro-mint chutney is what gives these sandwiches their unique taste, but you can experiment with the other ingredients. Sometimes I’ve tried other combos with the chutney like shredded cheese, tomatoes, lettuce or a giant all-in-one sandwich that has a little bit of everything! A little cheddar right on top of the potatoes tastes especially good if you are partial to cheese. Here’s a really good cheese and vegetables sandwich from Delighted Baking you might want to try, if you want a different version. However, if you want to keep it simple and fuss-free, the potatoes do taste great by themselves. Put all the ingredients in the blender and whizz to make a puree. Spread butter on one slice of bread and layer with a few potato slices. Sprinkle a little black pepper on top. 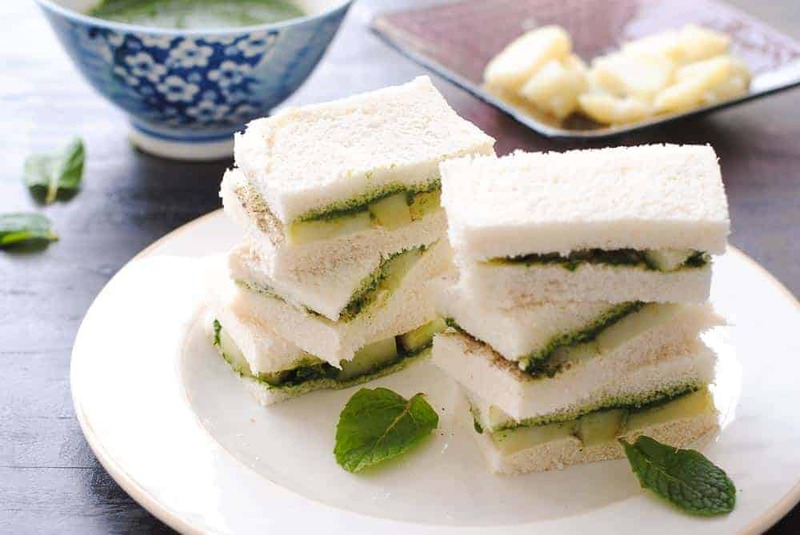 Spread a thick layer of chutney on another slice and place it on the first slice to make a sandwich. Repeat with the remaining bread and store the left-over chutney in the fridge. Sign up for my free newsletter and get the latest recipes, how-to tips and handpicked, actionable content from around the web. Psst! You will also get a free cookbook with 30-minute recipes for those busy weeknights! Psst! You will also get EASY WEEKNIGHT MEALS, a super-valuable e-cookbook: a collection of 30-minute Indian recipes for the busy cook!